This disease is a progressive and degenerative disease of the neurological system. This fatal neurological condition causes the breakdown of motor neurons that control voluntary movements. Over 20,000 people in the U.S. suffer from this disease and probably many more worldwide. It is most common in men in the fourth through sixth decades of life. This disease is commonly known as ALS or “Lou Gehrig’s Disease.” It received this name not because of who discovered it, but because the famous baseball player was one of the first well-known cases of Amyotrophic lateral sclerosis. The period of degeneration is relatively fast with this disease and Lou Gehrig’s deterioration came quite quickly, only two years after diagnosis. He died at age 38. ALS is actually quite common and the exact causes are still unknown. There are still experimental treatments and research being done, but there is no cure. The disease starts with weakness, leading to paralysis and eventually death. Patients who suffer from this disorder still experience pain, do not lose their cognition or memory and can see and hear normally. Motor functions are progressively lost until the patient is unable to walk, chew, swallow or breathe on their own. 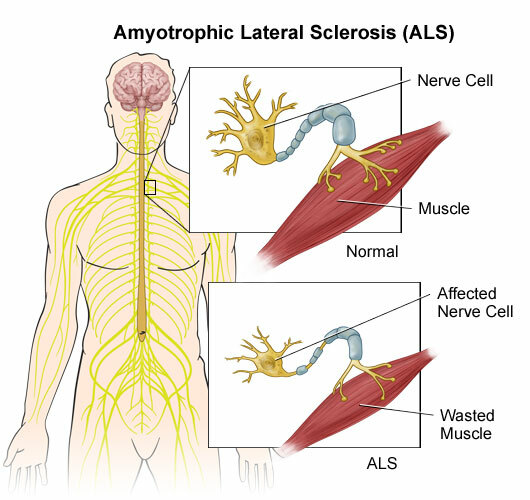 Amyotrophic lateral sclerosis causes both the upper and the lower motor neurons that control voluntary movement to die off. (See Figure 1) This leads to weakness, muscle death and then paralysis. The disease begins with the lesser needed muscles, moves to the arms and legs and eventually the muscles that control swallowing and breathing. Patients inevitably end up on feeding tubes and ventilators. There is also a high risk of skin ulcers, because patients cannot turn themselves in bed. The exact cause of ALS is unknown. There are many speculations that it may be set off by a virus or bacteria, but any clinical research on this has not been completely proven. There is also some incidence that it may be a gene mutation and familial, but this has not been proven. There are only 1 in 10 cases of Amyotrophic Lateral Sclerosis with genetic links. Another theory shows that the disease may be an autoimmune response by the body and it literally turns on itself and attacks the motor neurons. One other possible cause is a high level of glutamate, which is a chemical messenger for the nervous system. Sadly, none of the theories on the cause of ALS have been proven. This in turn has stalled research on treatments and a possible cure for this disease. Because the early symptoms of weakness and fatigue are connected to so many other conditions, the diagnosis of amyotrophic lateral sclerosis usually comes when symptoms are very advanced. Although, early diagnosis does not make curing the disease possible, some treatments may slow its progression and provide relief of symptoms. How is Amyotrophic Lateral Sclerosis Diagnosed? 1) Nerve Conduction Velocity Studies – Checks for nerve damage. Another test that is used is an MRI scan, which is used to try and find other causes of the symptoms and does not show any changes in ALS. Antispasmodics/Muscle Relaxants – These can help control muscle twitches and cramping. Amitriptyline – Helps to reduce saliva, control depression and aids rest. Neurontin – Can help to control nerve pain. Riluzole – This drug can help to slow the progression of the disease. In addition to medications doctors may prescribe physical therapy to help slow muscle atrophy, improve strength and can help patients feel better. Speech therapy can assist patient with coping with swallowing and speech difficulties. A speech therapist can also evaluate whether a change in diet is needed or if the patient needs to be placed on a feeding tube in later stages of the disease. When patients are in the end stages of the disease, they may need to be placed on a ventilator if the patient and family choose life support. Families are also given the option of placing the patient on hospice care when the prognosis time is 6 months or less until death. The choice is left entirely up to the patient and family. Ventilator management needs to be done in a long-term care facility where respiratory therapists are on staff in case of emergencies. Hospice care can be done in a hospice facility or at home. The good news is that the life expectancy for ALS sufferers is often 10 to 20 years after diagnosis. Some cases progress faster with a life expectancy of 5 years or less. One well known sufferer of ALS, Stephen Hawking has lived since the 1970’s with the disease. There is no prediction which patients will progress slower or faster. It is important to seek medical attention if any symptoms of this disease appear. With proper medical care, proper medications and healthy lifestyle choices the effects of the disease can be lessened and patients can be made comfortable.